One of the biggest sporting events was held a few weeks ago. However, not everyone is particularly pleased with some of the things that went on. Here’s why. Philadelphia Eagles became the NFL champions of the 2017 season last Sunday at the 52nd annual Super bowl championship game. The championship game is usually what makes all the headlines. However, the most exciting thing people talk about is of course the Pepsi halftime show. Some of music’s legends like Michael Jackson, Madonna, Prince have performed at this event. It is a big career highlight for a pop star to perform at the Super bowl. This year, Justin Timberlake made his third appearance (a record), while appearing in two previous performances, one with his former boy band NSYNC and another appearance with Janet Jackson. Justin started off his performance with some of his more upbeat songs, like one of his early hits “Rock your body”. The performance continued with him performing more chill songs like “suit n’ tie”. He later payed tribute to the late Prince by playing one of Prince’s songs, while a projection of him was projected on a massive sheet. And of course, a JT show wouldn’t be complete without him performing his hit “Can’t stop the feeling”. Here’s where the controversy comes in. Days before the Super bowl, rumors sparked of a Prince hologram appearing in Timberlake’s performance, and that if that would happen, Prince’s fans wouldn’t be pleased. The reason for this is that, before his death Prince said that for religious reasons, he wouldn’t want a hologram to be made of him. In a 1998 interview, he said; “That virtual reality thing… it really is demonic, and I’m not a demon… that will never happen to me”. While Justin may have had good intentions with the tribute, Prince’s fans were outraged for the “disrespect” the 37-year-old has showed Prince’s will. When asked about his Tribute to Prince, Timberlake said: “I felt like I wanted to do something for him that would just be the ultimate homage… I wanted to take the opportunity to do something special for this city” (referring to Minneapolis, where the Super bowl took place and the city where Prince is from), he continued, “but most of all I wanted to do something special for my favorite musician of all time”. However, things haven’t always been this way between Justin and the Purple one. Back in 2006 Prince made some mean comments on one of Timberlake’s tracks, one year later at the 2007 golden globes, Justin mocked prince while accepting an award on his behalf. So the two weren’t the best of friends. In addition, many viewers complained about his vocals being muted or hidden beneath backing tracks, which immediately sparked a twitter war from complaining viewers at home. The Halftime show performance wasn’t praised too much by critics and didn’t bring something new to the table. So, That’s probably why he needed a Prince tribute, to boost up his performance. 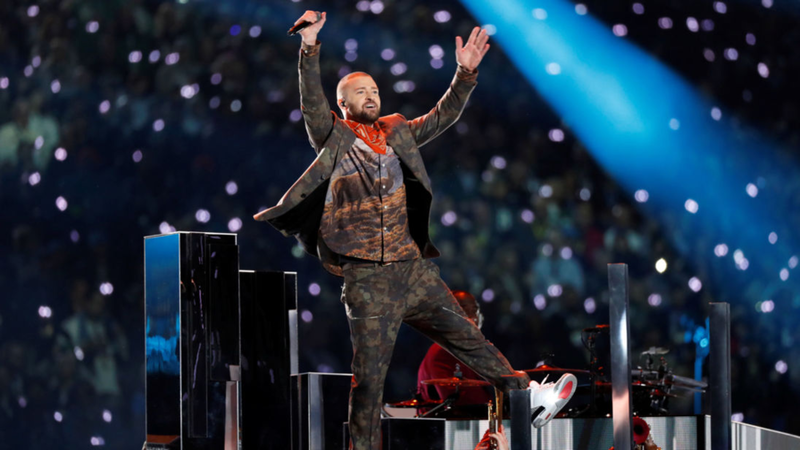 Watch Justin Timberlake’s full Super bowl halftime show performance here.